The Exposition Universelle of 1855 was an International Exhibition held on the Champs-Elysées in Paris from May 15 to November 15, 1855. Its full official title was the Exposition Universelle des produits de l'Agriculture, de l'Industrie et des Beaux-Arts de Paris 1855. The exposition was a major event in France, then newly under the reign of Emperor Napoleon III. It followed London's Great Exhibition of 1851 and attempted to surpass that fair's The Crystal Palace with its own Palais de l'Industrie. The industrial and art exhibits shown on this occasion were considered superior to those of all previous exhibitions. According to its official report, 5,162,330 visitors attended the exposition, the exposition covered 16 hectares (39 acres) with 34 countries participating. Marlborough House, London.—8th January, 1855. PARIS UNIVERSAL EXHIBITION OF 1855. 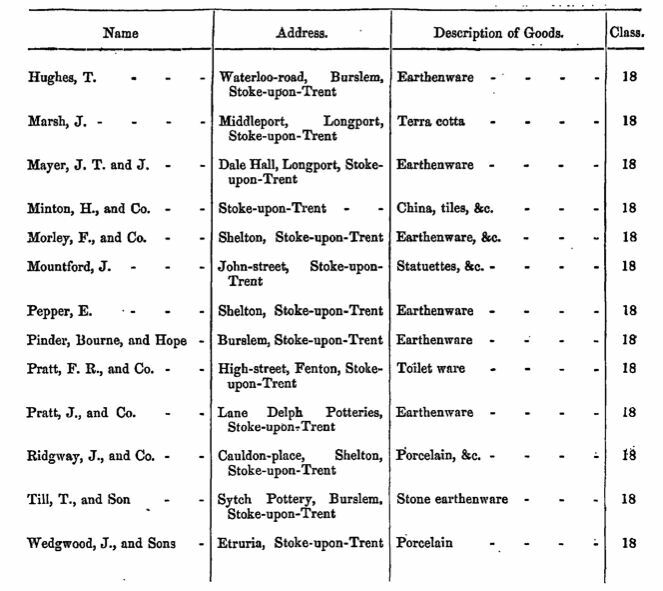 THE Lords of the Committee of Privy Council for Trade, at the recommendation of the Com- mittees to whom the distribution of the space in the Paris Universal Exhibition was entrusted by the Minute of this Board, dated the 12th September, and published in the London Gazette of Friday, the 15th of September, 1854, have confirmed the admission of the following Manufacturers and others as Exhibitors in the British Section of that Exhibition, subject to the Rules and Regulations of the French Imperial Commission,and those which their Lordships may find it necessary from time to time to issue for the special arrangements connected with the British Section of the Exhibition. LOCAL COMMITTEES IN THE COUNTRY. 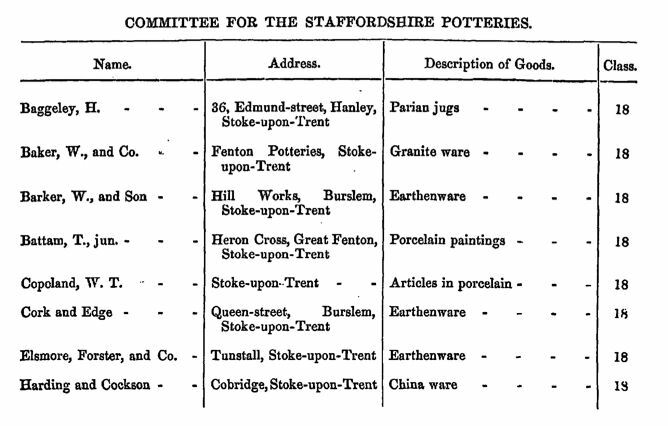 "Messrs. Minton and Co. are the most conspicous contributors of pottery in the Paris Exhibition. No single firm has contributed so many excellent samples of its manufactures. The collection, Englishmen will be happy to observe, includes some beautiful vases, drawn by students of the Schools of Design. Then there is the facsimile of the beautiful toilette service in blue and white parian, presented by Prince Albert to the Queen. The stand for scents is especially pretty in design; the various scents being marked by the groups of flowers from which they are extracted. The most complete specimen, however, of Messrs. Minton and Co.'s manufactures, is the great dessert service, in the centre of which are the two pretty candelabra, presented by the Emperor of the French to the Queen of England (which we have engraved). The collection of Palissy and Majolica ware, however, is that which appears to have created the greatest sensation among Parisian connoisseurs. The reader will remember that the main difference in these wares is that whereas the Palissy ware is coloured by a transparent glaze, Majolica ware contains the colour (opaque) in the material. 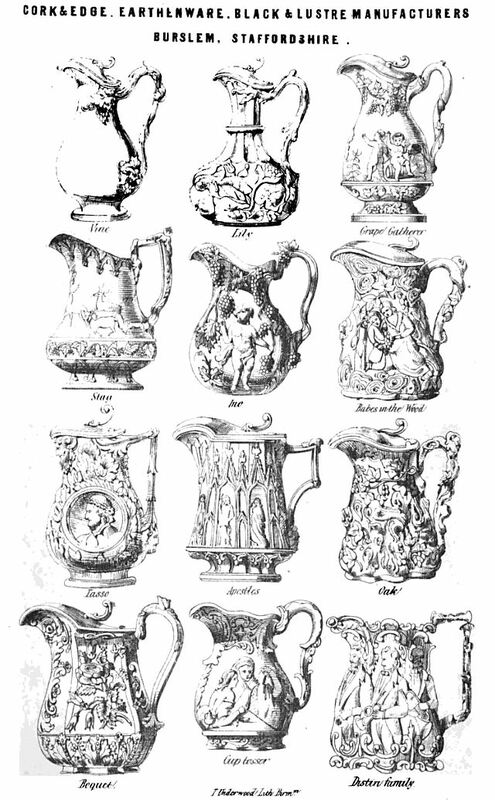 The care and taste with which these manufactures have been brought by the Messrs. Minton to their present state of perfection, have been amply rewarded. Within a few days of the opening of the Exhibition all the specimens exhibited had been sold. One sample of Palissy ware—being a little tea-service spread upon a leaf, the legs of the teapot being snails, all exquisitely finished—was bought by Mr. Redgrave. In addition to these contributions, there are some fine statuettes and busts in parian, including one after the Count de Nieuwerkerke's bust of the Empress; a bust of the Emperor; a statuette of Lady Constance Grosvenor; and Cain and Abel, by A. Carrier (a French artist), which we have engraved." Shelton Bar Iron Co. awarded Silver Medal, at the 1855 Paris Exhibition.